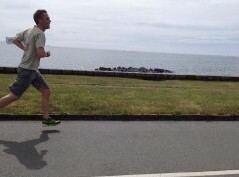 On 16 June, Guthrie took on the Guernsey Father’s Day Half Marathon and smashed the 1hr 40 minute barrier he was aiming for with a fabulous time of 1 hr and 38 minutes. Guthrie previously took on this challenge at the tender age of 11 in 1984 and was hoping to beat his juvenile self in 2013 at the tender age of 39 – which he is pleased to confirm he did!! Harriet and her sister Sophie will be running in the Edinburgh Marathon this Sunday, 26 May. Many thanks, Harriet and Sophie. Congratulations to Harriet and sister Sophie. Job done! 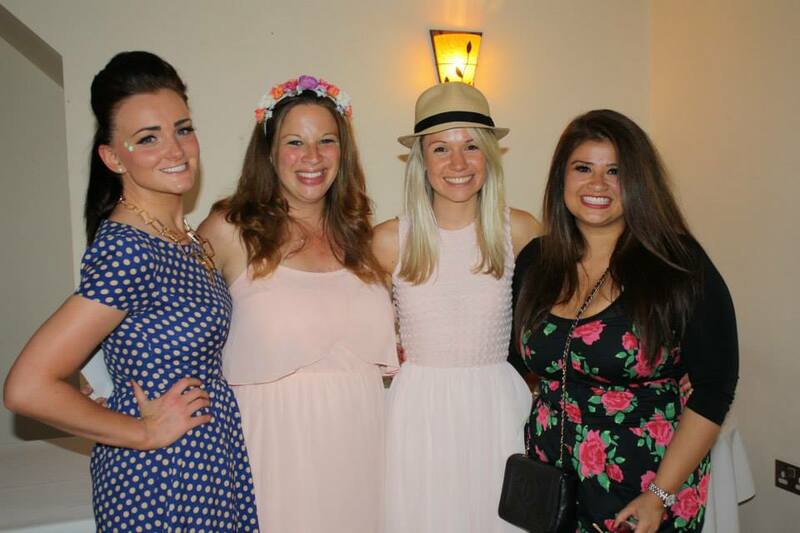 Lara’s Birthday Annual Summer Shindig – 13 July 2013 – A Fabulous Evening! On the first of what we plan to be an annual get together to celebrate all things Lara and to toast our triumphant Windermere Swimmers and Runners, we saw a fabulous evening of punch (potent), Prosecco, singing and cupcakes! The event was held at the Oak Royal Golf & Country Club in Withnell, a setting which came alive as the sun shone late into the night. 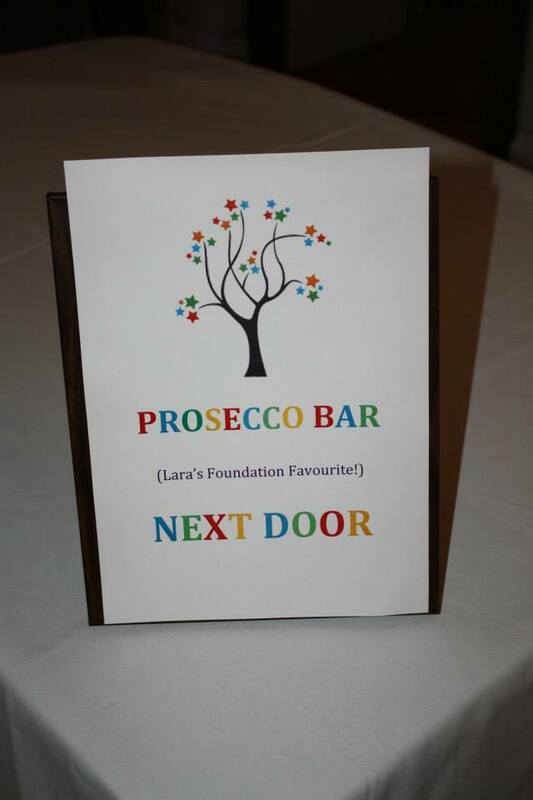 The Lara’s Foundation Prosecco bar made an appearance along side a girly lucky-dip jam packed with lovely nail varnishes (bright colours only of course), lippies and other delights – sorry boys! There were home made cupcakes a plenty, obligatory cheese and biscuits and a RAFFLE!!! We all love a good raffle and must say a huge thank you to all who donated to the prizes – which ranged from everything from a life size penguin suit, original artwork by Guernsey graffiti artist Sterone, a voucher for a car valet, a couple of bowling balls (!) and something to do with fishing that, to be honest, we didn’t really get to the bottom of! We were entertained on the evening by the sensational swing duo ‘Brothers of Swing’ who had the crowd tapping their feet and singing along in no time! Thanks boys!! The event made a whopping £1200 which, when added to the ever increasing total for donations made to the Windermere Challenge team during the day, bring us close to a totally incredulous total of £6,000!!!! Thank you for everyone who came to support the Summer Shindig, a special mention goes to Cazzy for her first class organisation, and to those who supported from a far through your donations. We’ve got something equally as spectacular planned for next year so WATCH THIS SPACE!! !